Your stay at The Merrill Hotel offers you recreation within the hotel, and, just outside our doors. Meeting attendees using our IACC certified conference venue near the Quad Cities often take advantage of our fitness center to keep up with their routine. And, everyone enjoys a swim in our indoor heated saltwater pool. It's also easy to explore the great outdoors of Muscatine starting at the nearby Running River Bike & Pedestrian Trail System, Riverside Park, and Muscatine Aquatic Center. You'll also find golf courses for all skill levels, baseball facilities, cultural attractions, and other local favorites, adding variety, and fun, to your time in Muscatine, Iowa. Muscatine is a mecca for great outdoor activities, and the best part is that you don't have to travel far from The Merrill Hotel & Conference Center. Spend the day splashing around at the Riverside Park splash pad or drop a line in for some great fishing at Deep Lakes Park. Whatever you choose, The Merrill is there for your return. Founded on a 160-year-old farm, this 4.1-acre vineyard has a variety of winter-hardy grapes and the technology they need to vent and bottle the grapes right in the winery. Fish, canoe, kayak, hike, and roam this 435-acre park including 130 acres of fishable water from numerous small lakes and ponds. Muscatine's indoor baseball and softball training facility is open year-round and features five batting cages that use a pitching machine, but can also accommodate live throws and pitching. It's available for groups, teams, and parties. This well-lit 66 acre park includes 9 softball diamonds, 8 baseball diamonds, and 9 horseshoe courts. This park hosts events sponsored by national, state, and local associations with participants of all ages. Home to the famous Muscatine Melon, Mariet's is one of the last remaining area growers. Here you'll find a bounty of fresh produce and flowers grown throughout the summer, and plentiful pumpkins in the fall. Find this interactive splash pad right on the Mississippi Riverfront. This fun water-time play area is a riverboat smokestack design that shoots water up to 30 feet in the air, and has four mist jets and four outer water cannons. This historical building, known as the Musser Mansion, for it's original occupant, houses a museum, dining room, music room, reception room, second floor galleries, library, and memorial bedroom. Located inside Weed Park, have summertime fun with five slides (two drop slides, one family slide and two long slides), a zero-depth entry area, and an interactive play structure with kid slide and spray features. Find this 18-hole disc golf course at Fuller Park, accommodating players of all skill levels from first timers to those seeking a more challenging game. Holding 18 slips for houseboats and 64 slips for pleasure/speed boats, the Municipal Boat Harbor is the perfect place to fill up with gas before spending the day fishing or enjoying water sports. Hit your golf ball over the water on No. 13 when you take the challenge at this 18-hole traditional course. The facility offers a complete pro shop, concession area, cart rental, and driving range. This award-winning, 3.8-million-dollar complex consists of 41 acres featuring eight full-sized, premiere soccer fields. The Muscatine Soccer Complex plays host to events sponsored by national, state, and local associations with all ages of participants. Located at Musser Park, this park lets enthusiasts hone their skills on skateboards, roller blades, and BMX bikes in an area suited for their needs. It also features a flat track, obstacle/stunt area with a variety of steel ramps and an in-line hockey rink. As the only bridge over the Mississippi River featuring LED lights, the Norbert F. Beckey Bridge stretches 1,500 feet and displays fabulous light shows at night. Across from The Merrill Hotel & Conference Center you will find Riverside Park recreational activities like the interactive Mississippi Mist Fountain Splash Pad, basketball courts, playground, and boat launch. 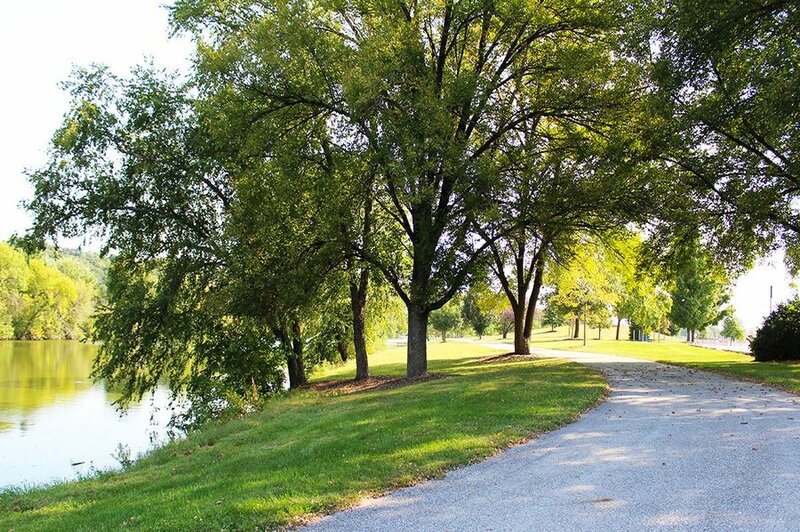 With over ten miles of paved and unpaved trails, walkways and parks, the City of Muscatine has more than 550 acres of land where you can run, walk, or bike. Home to the Muscatine Aquatic Center, this 72-acre park features a Zoo Garden, Rose Garden, playgrounds, bandstand, picnic areas, fishing for children, 10 tennis courts, and 2 sand pit volleyball courts. One of the most unique state parks in Iowa located 10 miles east of Muscatine, Wildcat Den State Park has a trail system, rock outcroppings, creeks, and is home to one of Muscatine's original mills, Pine Creek Grist Mill.